Come and celebrate the beginning of Autumnal abundance at the Earthship Fife Visitor Centre, on the shore of Kinghorn Loch. 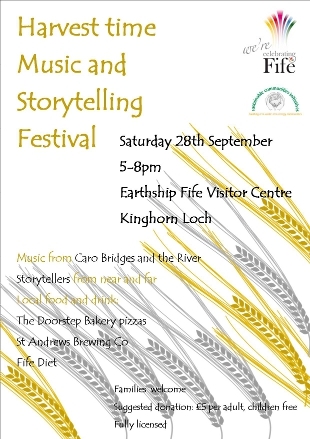 SCI at the Earthship is hosting a music and storytelling festival for families on Saturday 28th September (5-8pm). Adults and families are invited to come along to listen to musicians and storytellers sharing Autumnal songs, music and stories, all powered by the Earthship’s renewable energy from the sun, wind and stream. The music will provided by Caro Bridges and the River; an Edinburgh based acoustic band playing folk-influenced music. The Doorstep Bakery will bake delicious wood-stove pizzas and Fife Diet will provide a warming pot of nourishment, which can be washed down by local brews from the St Andrews Brewing Co.